Carol Ann Harnett offers a practical way to teach about the Sacrament of Reconciliation. This is a central part of preparation for First Holy Communion, and important in establishing a positive and lifelong understanding of God's forgiveness and mercy. The Sacrament of Confession /Reconciliation /Penance is a most wonderful Sacrament and we are fortunate to have this amazing gift from God. Confession looks to Christ the “physician” of our souls” (CCC 1421) to restore us to wholeness after our turning away from God in sin. Only God can forgive sins (Mk. 2:7). In this Sacrament, God, who created us to relate to Him, reaches out and draws us back into His fold. In order to present this most valuable Sacrament in a positive light to children we need to regularly receive the Sacrament ourselves. After explaining why we need Confession we will look at the priest’s prayer of absolution, as the focus for the Children’s preparation for this Sacrament. A brief look at the Sacrament’s different names, will lead to a more detailed consideration of “forgiveness” and some ways in which children can come to experience being forgiven and learn to forgive. After looking at the effects of the Sacrament we will look at the general “mechanics” of the Sacrament and how children can be prepared for their first Confession. Original sin: Before children can understand their own sin, they need to know about original sin. A retelling of the story of creation along with the disobedience of Adam and Eve is crucial. Most story book accounts refer to an apple, but you will look in vain for the apple in Genesis Chapter 3. It only mentions that “the tree was good for food and it was a delight to the eyes” (Gen. 3:6). In other words, we are tempted towards something which appears to be good. It is really important to emphasise that God’s love for Adam and Eve never wavered – that although they disobeyed Him and did not love Him as they ought, His love never ends (CCC 25). Sin: Something I deliberately choose to do, knowing it is wrong, or something I deliberately choose not to do, which I should have done. In each case I have not loved God and/or other people. Activity 1: Aim: To know the difference between a sin and a mistake. Make a set of cards with sentences on them such as “I did not help Mummy lay the table after she asked me to,” “I took Fred’s pencil because I liked it,” “I dropped my dinner plate by accident” “I took Fred’s coat, thinking it was mine,” etc. Make two heading cards, one called “Mistakes and accidents” and the other, “Sinful acts; not loving.” The children can sort the cards and discuss why some acts are sinful and lacking in love and others are not. This session can end with a short time of personal recollection with the children being invited to think quietly of times when they have not shown love to others. This is beginning to teach them to examine their conscience. Activity 2: Aim: To be introduced to the prayer of Absolution. Display the prayer with the underlined words clearly marked. Explain that during their preparation the children will come to understand what they all mean. Begin with the last one – the Holy Trinity. Say that everything that is done in the Church is in the name of the Father and the Son and the Holy Spirit. Ask for the “technical term” for this (answer: the Holy Trinity). Remind the children that they were baptised into the Holy Trinity and that every time they make the Sign of the Cross they remind themselves of this. This Sacrament has had different names and even today some people say Confession and others Reconciliation. The Catechism uses both Reconciliation and Penance and CCC 1423-24 lists five names which reflect different aspects of the Sacrament. As different words may be used, children need to be introduced to them. “Technical” words are put up and definitions are read out. The children say which is being described. Conversion: Jesus calls us to turn back to God. Confession: We tell God, through the priest, our sins. Penance: We make up for our sins and lack of love by showing more love to others in our prayers and actions. Reconciliation: We are once again in a loving relationship with God, who asks us to be reconciled and loving to each other as well. This can be extended to include terms such as absolution, concupiscence, mercy, pardon, forgive, grace, etc. Children in groups act these scenes from the Gospels. After each “play” questions can be asked, such as “Who forgave the sins?” Why did Jesus forgive?” “When else does Jesus forgive?” “When does Jesus forgive us?” “What did the Prodigal Son plan to say to his father?” “Who does the father in that story represent?” It is important that the questions direct the children both to the Gospel accounts and to their life of faith, and not to their feelings. 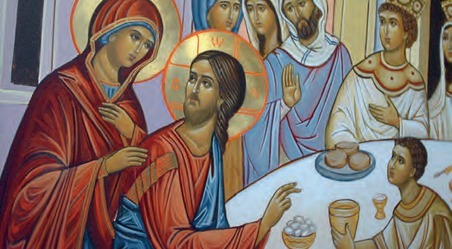 To conclude this activity, it is important to explain that in the Sacrament, although they see a priest and he will say “I forgive you” because he is there in the person of Christ, it is Jesus who does the forgiving as He did in the Gospels. Christ teaches that we must forgive one another and that God’s forgiveness is conditional on this. (See Mt. 6:14; 18:21-22; Lk. 17:4). Children learn by example and will learn to forgive when they know they are forgiven. We can help them to be aware of this by saying “I forgive you” to them. This is a very humbling act and it can make us feel a bit vulnerable but I assure you, not only will it help the children to understand what forgiveness is, but when a child says in return, “Don’t worry, Mummy, (or Miss) I forgive you,” you know that they have grasped this important concept. Incidentally, we do not have to “feel” forgiving in order to say “I forgive”. To forgive is a decision, not a feeling and feelings come later. Saying “I forgive” when hurt serves to remove frustration and anger. This is also a way of teaching children about grace – only by God’s grace can we forgive others – we cannot forgive in our own strength. Reconciliation with the Church (1469). To understand this children must recognise that sin separates them from God and from one another. Reconciliation happens through the Church because the priest is a minister of the Church. He does not act alone. Activity 5: Aim: To understand that sin damages themselves, others and causes them to be separated from God and one another. Use the same cards as in Activity 1 (those which mention the sins). Invite the children to think about how the acts hurt other people and offend God. Remind them of Jesus’ saying that what we do to others we do to Him. (Mt. 25:45). 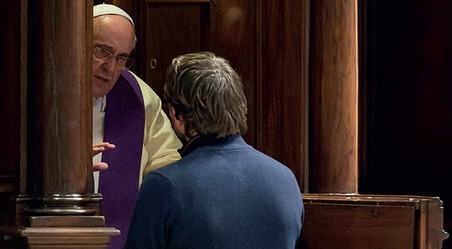 Unlike preparation for first reception of the Eucharist, children do not necessarily see people receiving the Sacrament of Reconciliation, so a careful explanation of the process is necessary. This is addressed to the children. Read or think about a time when Jesus forgave sins. Are you sorry for the sins you have been committed? Ask Jesus to help you to not to do these things again (this is called “firm purpose of amendment”). You will meet a priest. Because he is there in the person of Christ, it is really Jesus you are talking to. The priest will NEVER EVER tell anyone what you have told him, not your parents, teachers, the police or anyone, ever. Begin with a Sign of the Cross. Then tell the priest your sins. He may chat to you about your sins and how not to do them again. The priest may either raise his right hand or stretch it out over your head and will say the prayer of absolution. He will suggest something to do to show that you are sorry. Usually this is saying some prayers, or doing something kind for someone. This is called Penance. Whilst it is not really possible to “practice” going to confession, a story board or diagram of the process can be helpful. Mrs Carol Ann Harnett is a teacher with over 30 years’ experience of parish catechesis with all ages, and working with and forming catechists. Currently she works with the School of the Annunciation in the formation of catechists.